And if you’re already sold on starting a site, skip to Video 5 below and I’ll show you how to get it online in a hurry. Do you like how the thumbnail for this video paused right on the “make money” slide with me doing the Mr. Burns thing with my hands? In any case, that’s just one of the reasons I think you should start a blog. 1. Blogging is a creative outlet – it’s fun! I’ve always loved writing and the consistent practice of writing online has made me a better communicator and allows me to exercise my creativity in ways I never really thought it would. I’ve written well over 1000 blog posts at this point, and never would have gotten that far if it wasn’t fun. 2. Blogging lets you share your ideas with the world. Some posts of mine have been read 10s of thousands of times, which is awesome! On top of that, you’ll get comments and emails from readers saying how much you’ve helped them. It’s a really cool feeling. 3. Blogging can make you money. For many viewers and side hustlers, that’s what it’s all about. Blogging is one of the channels that lets me earn a full-time living working from home, and it’s just a really powerful platform to serve an audience you can help in some way. The caveat to this is — in most cases — your blog isn’t a business on its own. But it CAN help you build one. 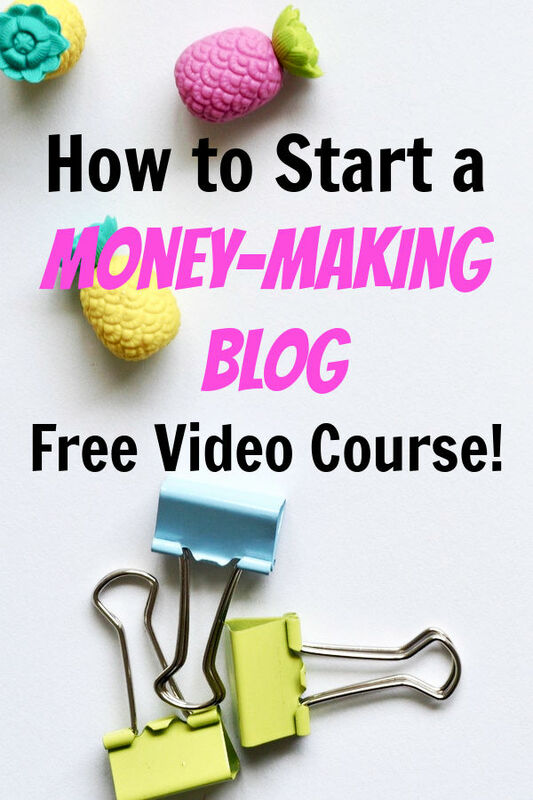 We’ll get into how blogs actually make money in Video #3. 4. Blogging builds your network. Once you get started online, you’ll find an incredible and supportive community. A few years ago, the scale tipped in my personal life, when my number of “Internet friends” (as my wife calls them), began to outnumber my “real life friends.” Today it’s not even close, and that wasn’t intentional or expected, but it was 100% a result of putting myself out there online, starting with a blog. Now I have friends and connections in nearly every city in the world, and have been able to meet up with readers in Tokyo, Chiang Mai, Barcelona, Prague, and all over the United States. OK, I know this whole series is on “how to start a blog,” but calling your new website “a blog” is probably a recipe for disappointment and failure. To me, a “blog” sounds like an online diary — where you’re going to share what you did today, pictures of your kids, or what you had for dinner — and if that’s all you want to write about, that’s fine, and you can still follow Video #5 to get it set up, but don’t be surprised when not too many people are interested. That type of “online diary” site might work if you’re a celebrity, but if you’re not (and if you eventually want your site to make money), don’t call it a blog. Instead, call it what it is: a website, a brand, a business. Personally branded sites are just fine — Side Hustle Nation is very much a personally branded project, meaning it’s got my name and face all over it. I call this the “reason to exist” — what’s the point of your site? With entertainment, you’re up against House of Cards and Game of Thrones, YouTube, ESPN, and Fantasy Football — it’s tough to compete. But helping people solve problems, especially if you can do it in a unique or entertaining way, that’s where the gold is. Your new website might be a hobby or a side hustle at first, (it certainly was for me), but when I started treating it like a business and not just a blog, that’s when things started to take off. Blogs — or rather websites or online businesses — can make money in a ton of different ways. In this video, I’ll walk through 8 real-life monetization examples so you can see what each one looks like in practice. This is perhaps the easiest monetization strategy for a new website. Affiliate marketing is where you link to a product or service you recommend, and earn a commission when your visitor buys. This is still one of my primary revenue streams and lets me partner with brands like Udemy and Amazon. Here’s an example of a post on Side Hustle Nation that’s monetized with affiliate links. If you’re a coach, a consultant, a freelancer, or a speaker, your website and blog can be a great way to showcase your portfolio and attract new clients. You can use your blog to sell your own physical or digital products. Through my site I’ve sold digital products like ebooks and courses, and physical products like t-shirts. Contextual and display advertising can be a lucrative income stream if you have enough traffic to your site. In fact, some friends of mine bring in thousands of dollars a month in this way. Some brands will pay you to host sponsored posts, where the content is directly or loosely connected to their company. I’ve been paid several hundred dollars at a time for these sponsored posts, and am now accepting sponsors on my podcast as well. Here’s an example of a sponsored post from the Side Hustle Nation archives. Some websites and bloggers maintain a private community for their readers, and often charge for access. The Dynamite Circle private mastermind forum at TropicalMBA.com is an example of this. Another way for bloggers to make money is by hosting live in-person or online events. Sometimes this starts with a premium online live training, but can graduate to full-fledged multi-day conferences. The 8th way blogs make money is through direct contributions and donations from readers. If none of the other monetization channels make sense for you, you can ask readers to support your work directly. While it’s a good idea to familiarize yourself with the different monetization strategies that are out there, you don’t need to figure out your entire business model right now. First, you’ve got to figure out what your site is going to be all about, and that’s the topic of the next video in this series. So far we’ve been through why you should start a blog, why a blog is actually a bad label for what you’re building, and how these brands, websites, and online businesses actually make money. But what are you going to write about? One critical ingredient in every blog on earth is the content. It’s true about online business: a site that tries to appeal to everyone is just going to get lost in the noise. Niching down makes it easier to find your people and quickly showcase how you can help them. My rule is to pick something you care about. It doesn’t have to be an undying passion of yours, but you have to care enough about it to keep going. As you’ll see in the next couple videos, starting a blog is the easy part. It only takes a few minutes and a few dollars. Keeping it going until you start to see some traction is what’s hard. Finally, once you have a topic in mind, I like to do a little mind-mapping / subcategorization exercise. Basically, trying to figure out what subtopics I can write about under the umbrella of my main topic. If you can come up with 5-10, you’re doing great. If you have more than 10, you might consider niching down a little more. 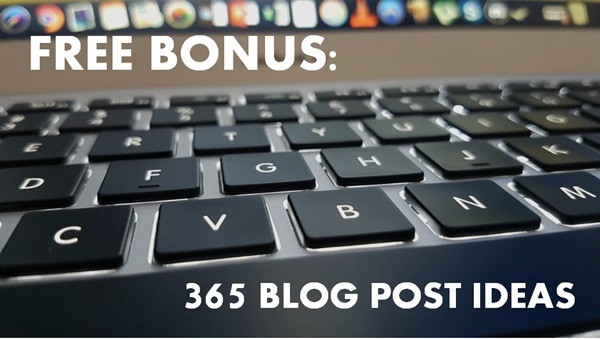 Free Bonus: Click here to download the 365 blog post ideas. The good news is you can get them both at the same place, and I’ve partnered with Bluehost to get you an awesome deal. Your first domain is actually going to be free, and reliable hosting is crazy cheap — just few bucks a month. It’s an incredibly small price to pay to get your site available to a worldwide audience. *For disclosure, that is an affiliate link. 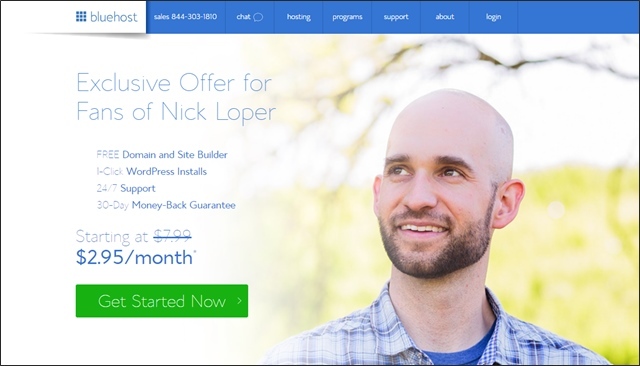 As a side note, you CAN get free hosting, but it comes with some serious drawbacks: Your image is going to be cheapened by having another company’s name in your URL, like nickloper.blogspot.com, which looks unprofessional. Second, and most importantly, your functionality is severely limited on these free hosting setups in terms of what plugins you can install and how you can improve your site’s visibility in Google. 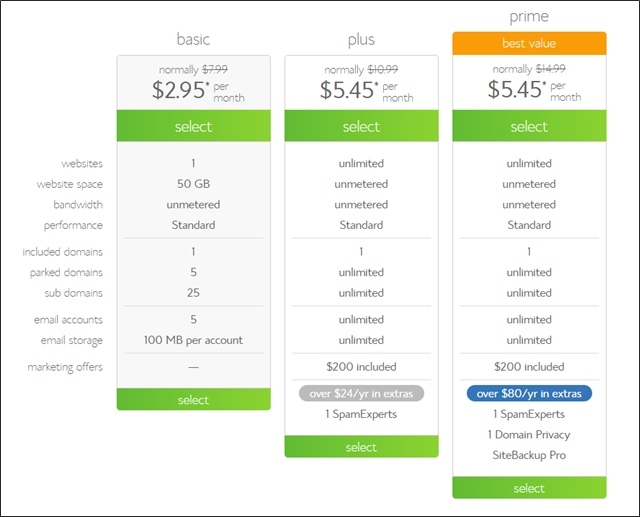 The good news is that your domain and hosting really are among the most affordable startup costs in the history of business. One click WordPress installation – I’ll show you how to do that in Video 6. Safety in numbers. Bluehost powers 2 million websites worldwide, including several of my own sites. *To claim, sign up through my affiliate link above. Then forward your Bluehost receipt to [email protected] along with your preferred mailing address and I’ll get it in the mail to you right away. The first step is to pick your hosting plan. The “basic” option is probably all you need when you’re just starting out. If your needs grow, you can upgrade at any time, but I always like to start lean. Next, they’ll ask you to pick your domain name. This is the URL or your website and what visitors will see in their browser bar, like sidehustlenation.com, espn.com, cnn.com, etc. If you know what domain you want, you can punch it in right away and check availability. You can consider a domain name that illustrates the topic of your site, or you can even register yourownname.com, which leaves you open to pivot topics later if your interests change. Now you might find that your first choice — or first few choices for a domain name — are taken! In that case, one cool tool I like to help brainstorm available domains is NameMesh.com. Once you’ve got your domain, you’ll select your Bluehost password and be able to access your hosting control panel. In this video, I’ll show you how to quickly install WordPress on your new domain name. In your Bluehost hosting dashboard, scroll down to where it says “website” and click the button for “One-click install”. From there, it will ask you what software to install (WordPress in this case) and where to install it (on your homepage in this case). You can also use this tool to install other content management systems but I’ve found WordPress to be the most customizable and robust platform to create on. Once WordPress is installed on your site, you can click the link to view your Admin panel login credentials. If you open the /wp-login link and enter that information, you’ll find yourself in the backend of your very own WordPress site. The first thing you’ll probably want to do is to change the site title, which you can do by finding the Settings menu on the left side of the screen. You’ll notice that WordPress has installed the default theme for you, which looks pretty cool. However, one of the best features of WordPress is the giant library of free and premium themes available. You can see some of the free themes by visiting Appearance > Themes in your WordPress admin panel. You can search by keyword if you have a particular idea in mind, or you can browse the directory, preview themes, and install one you think looks good. Although these are designed to work well “out of the box”, you might still need to customize it a bit to make it 100% yours. This is what I’ve done with all my WordPress themes; find a “close enough” pre-written theme, and then customize it to fit my needs. Now you’re ready to start your website! Just one additional note: In your “General” Settings, you’ll need to click the link to take your site out of “Coming Soon” mode to make it visible worldwide. Thank you so much for checking out this website starter series and please feel free to let me know if you have any comments, questions, or feedback. started my blog almost 2 months ago. tons to learn but its been great. the writing is almost therapeutic in a sense. thanks for the inspiration Nick. Just installed WordPress, I’m about to start this journey. Thanks Nick for all the info you put out! Love your podcast! Want to get started with WordPress. Is it mobile compatible ? Thanks Nina. Yes – most modern WordPress themes (even the free ones) are mobile friendly. Would love a “Part 2” to this (or a longer article). Okay, so you’ve got a business idea in mind, maybe even some monetisation in mind (what you’re gonna sell). There’s a bit behind picking a name, which I think could warrant it’s own little blog post. But the Part 2 I’d like is a post that continues on from installation to basic set up. You know, the bits about wordpress links and which basic plugins to install, how to tidy it up…and even some recommended free themes that are actually decent. I like it! Thanks Steve! Great tutorial. Who do you recommend when you’re ready to move past basic hosting? I use WPX Hosting now for Side Hustle Nation. $25/mo, super fast chat and email support, and up to 5 sites on that one account, vs. 1 on WP Engine last I looked. Hi Nick, great content! Do you know if hostgator is a good choice? I need hosting for several websites. They have reseller account. Also, about the niche. I am considering writing about topics that “solve problems” to brazilians that are living in the U.S. I’ve been here for almost a year now. But I lived here for 6 years. I can help with finances and business management, as I’m a consultant for small business, as well as little things… what you think? Great post, we run a travel blog and I think the most important thing we tell people is to travel with a purpose, Do not just wander around the world aimlessly. (Like ours is to experience and document the Top 100 Travel Adventures) So many travel blogs do not really have a purpose or a niche. Niche is key and many miss out on that because they want to cover and do it all. Do not just start a blog because you think you will get rich quick and be able to travel the world. It takes a lot of work and lots of time. Thanks for this incredibly useful video! I am planning on starting a blog, but I also want to be able to connect to Pinterest via my blog which would mean getting my website, on WordPress, verified by Pinterest. I believe for doing this a Yoast plug-in is required. Does this version of WordPress that we get with Bluehost allow third party plug-in installation? I am specifically asking about Yoast, as I want to be able to add affiliate links on my website. Great content! This is very helpful. Question: how important do you believe it is to have a catchy, memorable domain name? Is that really important for SEO? I’m launching a site however when I went to bluehost to register I found out the domain I really want is taken (howtoquitsmoking.com). I emailed someone selling the site and found out it’s priced at 25k (!). Do you think there’s a big SEO difference in .com vs .net’s etc? Is the domain name irrelevant, so long as you have great content that people want to visit your site for? I apologize if you’ve already covered this topic elsewhere, I just couldn’t find it on your site anywhere. Thanks for your time. For SEO, my understanding is having your keywords in your domain CAN give you a boost, but not nearly the boost it once did. While I’d always try and get a .com, I’m not convinced the alternative TLD extensions (.net/.org/.us/etc) will penalize you in the search results. I think you can build a helpful, authoritative site on a non-.com extension. The bigger issue may be brand confusion down the road, since most users will default to typing in the .com and that could be bad news if it leads to the site of direct competitor (and may open you up for trademark concerns too). Thanks Nick, I appreciate the info! I wish I’d seen this before I hosted on WordPress. I was so excited to start that I didn’t shop around for different hosting platforms. I would have saved almost $40 by using Bluehost. Ahh, darn. Live and learn. More writing to do now. This post is amazing. Looking to launch my own blog in 2018 and already started some draft posts. This both inspires and affirms that I am on the right track. Thanks so much for putting all this together. It’s gold! Thanks Nick for this content, very helpful as usual! Let’s rock with blogging: just starting a 30 day challenge to prepare the content of my blog. First step was this article, thanks also for the motivation boost! Can i install WordPress thème on mobile ? Most modern themes are going to be mobile responsive, but I’ve never attempted to start/build a blog from my phone. Very little do some people know they can make money just by reading a book or magazine and write a review about it in a blog. This is the good thing about the internet because there’s all sorts of ways to earn real money online. Hey Nick! Thank you so much! I already have my website on WordPress but I failed to pay my hosting (I only paid for 6 months), how do I shift the hosting from a different hosting company to bluehost? Moving hosts is usually a 2-part process. The first is to move all your files over, and the second is to “point” your nameservers at your domain registrar to your new host. Thanks for the great instruction. I’ve been playing with the idea of starting a website for awhile but I’m starting tonight. I will also continue to scour your articles for more info! I really enjoyed the videos and thought they were informative and helpful! One question though. What will happen if I already have a wordpress and then get blue host? Will it delete my website or even let me use the same domain name? Thanks so much for your time! Thanks Nick for this post and also been listening to your podcast for some time now. What were years of procrastination have now eventually ending up in my starting my site / blog / business and a month in – learning heaps, having fun and positive something will come of it. Thanks for all your great work on the podcasts, really helped me get started. I am not interested in starting a blog but a news and entertainment video-based type of website (my own videos, not someone else’s). I have no interest in teaching anyone anything. Can these tips apply to what I am trying to do? Of course Shaye. But before you build it, consider why someone will get their news and entertainment from you specifically? For what you’re describing (making videos), does it make more sense to start on YouTube? Thanks for this great tutorial. Also love your podcast! Little confused about why I would go through blue host rather than starting a free blog directly on wordpress? First, Your image is going to be cheapened by having another company’s name in your URL, like sarasblog.wordpress.com, which I think looks unprofessional. What’s the difference between blue host and WordPress premium? Because I noticed that WordPress also gives you a domain name if you pay for it…? Does this version of WordPress (through Bluehost) allows me to install all the plug-ins that come with WordPress Business? Thanks Nick! Good information. I recently started a podcast and added a blog. My podcast is Finding Hope Podcast. I interview cancer survivors. I am a cancer survivor of 27 years. So I really enjoy the work. Learning the in and outs of podcasting and blogging. What is the best way to move on from here? Thinking I need a mentor or mastermind group to help peruse all my ideas and keep me focused. I started my blog 2 weeks go, and very exited, just want to learn how to make it better. Hey Mike, thanks for stopping by. The first rule of social media is be on the platforms your target readers are on. But as far as managing subscribers, I’d prioritize email above all else. have you check out Anchor? HEY Nick. I just signed up for WordPress and paid for s domain name. Do I still need web hosting by blue host? does it worth using a free website lile wix or wealthy a… in order to start? Any tips for photobloggers in particular and users of Tumblr? I just started a travel blog on Tumblr and I’m interested to see if there is a way to obtain a domain name that does not include “.tumblr” in its copy.